Q: I have used the trial version of PDF Studio to edit a PDF document. I have saved the document a few times. Once I purchase, will the software automatically remove the watermarks added? A: As of PDF Studio version 8, activated copies of PDF Studio can remove the “demo version” watermarks added to the documents during evaluation. This will only work for demo watermarks added in PDF Studio 8 or above. Look for the “Remove Demo Watermark” button located under Help > License Information. 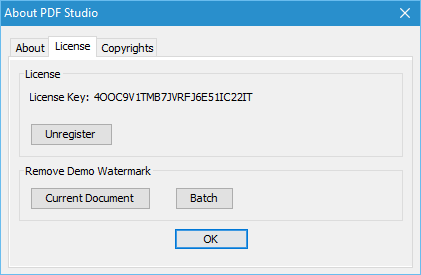 In PDF Studio 11, we will be adding a “Batch” button to remove the demo watermark from a batch of documents.